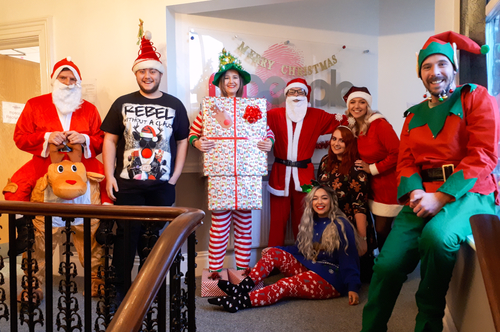 It was time to embrace the Christmas spirit as Mpeople Recruitment and the rest of the Major Recruitment group dressed up to raise £252.25 for Save the Children on Friday the 14th December. Although the annual event usually requires participants to dig deep and dust off their Christmas Jumpers, our staff took it one step further with their outfit choices (as you can only expect from a team of competitive sales professionals). Christmas had definitely arrived in Oldham with appearances from the ‘Elf on the Shelf’, and Father Christmas himself. It wasn’t just our Oldham office that joined in the festive fundraising fun – the entire Major Recruitment group of companies joined in to raise money for a great cause! The star of the day was Harriett Busby from our Mpeople Accountancy & Finance team who was awarded ‘Best Dressed’ across the business, for her quirky idea of an outfit made from boxes decorated as Christmas presents. Save the Children’s Christmas Jumper Day aims to raise funds to make a brighter future for millions of children around the world that are missing out on education, healthcare and essential food.